Following an almost unbearable break after the Conference Finals, the Stanley Cup will finally begin tonight. I hope at this point you trust my predictions. I nailed both Conference Finals, which matches my performance last season. I'm 11-3 on the season and 22-7 over the past two. However, I refuse to accept responsibility if you lose your kid’s college fund gambling. The more I think about this match-up the more confused I become. The Sedins are definitely superior to all other forwards on both teams, but the Bruins are full of two-way players and their depth throughout the line-up could be the equalizer. However, the Canucks are just as deep, especially if Manny Malhotra can actually play at a reasonable level. Although now there are reports that Malhotra won't play. Who really knows at this point. It's important Malhotra plays because he was 61.7% on face-offs during the regular season and the Canucks need someone to counter Patrice Bergeron because the Bruin centreman has dominated this post-season, winning 62.3% of face-offs. If Malhotra is able to play responsible, defensive hockey like he is capable of, a heavy defensive burden won’t fall on Ryan Kesler, who will need to play like he did in the second round if Zdeno Chara can neutralize the Sedins. Both Nathan Horton and David Krejci are scorching hot right now and Milan Lucic is showing signs of life, but the Sedins are looking like the confident duo that terrorized the league all season long. While the Sedins are clearly the best forwards on either team, Zdeno Chara is undoubtedly the best defenceman on either blueline. Chara and Denis Seidenberg will be responsible for shutting down the Sedin twins. The Sedins were held to seven points in the second round after being swarmed by Ryan Suter and Shea Weber, but exploded against the Sharks for 18 points after being unshackled. If Chara and Seidenberg can limit the Sedins like Suter and Weber did, the Bruins have a legitimate shot. The Canucks approach to defence is much more balanced. Both Kevin Bieksa and Christian Ehrhoff are having the type of post-season that every agent dreams of. Shadowed by the two soon-to-be free agents is Alex Edler, who is playing great two-way hockey as well, yet no one seems to notice. If Keith Ballard stopped Mike Komisareking, the Canucks could role three solid defensive pairs. Chara tips the balance in this match-up. Tim Thomas is going to win this year’s Vezina Trophy, but you wouldn’t know it by the way he played in the Conference Final. The Boston netminder’s GAA ballooned during the seven game slug-fest, but he shut the Lightning out in the deciding game. Even after allowing 20 goals against the Lightning, Thomas’ SV% is still .929. Luongo receives far less praise than Thomas and much more criticism, which is something I don’t totally understand. Since the first round, Luongo has been incredible, allowing over two goals on only three occasions. His 2.29 GAA is identical to Thomas’ and his SV% is slightly lower at .922. Enough talk about Luongo not coming to play in the big game. He silenced everyone in game 7 against the Hawks and not so long ago backstopped a little upstart Canadian team to an Olympic Gold medal. He’s good. This is Boston’s major flaw. It’s unbelievable that a team could actually make it to the Stanley Cup Final with a power-play so laughably pathetic. The Bruins have scored five total power-play goals, which results in a miserable 8.2%. The Bruins will need Tomas Kaberle to give them some measure of production; otherwise the season could very well be over because the Canucks operate at a cool 28.3% and will bury the Bruins if given the opportunity. Neither team possesses an overly dominant penalty kill. Both teams hover around an 80% success rate, although the Canucks have taken nine more penalties over the course of the playoffs. Both head coaches cut their teeth with the Montreal Canadiens, but neither had a great deal of success with the Habs (although Vigneault was nominated for the Jack Adams Award during his stint). This is new territory for both men, as neither had previously made it past the second round before this season. Julien is cut from an old school Jacques Martin style of coaching that preaches defence first and also seems content sitting on a lead. It’s clearly worked considering the Bruins are in the Stanley Cup Final, but it causes my Dad great consternation and he’s ready to fire Julien at any moment. That’s unlikely, but I’m definitely not writing it down in the pro column. Vigneault has already won a Jack Adams Award and could win another this season. That’s probably going in the pro column. The Canucks have certainly faced better opposition along the way to the Stanley Cup Final if you believe that the Western Conference is generally better than the East (which I do). They dominated a polished San Jose team in the Conference Final, which was a better team than the one that made last year's Conference Final. They have played 18 games, which is the same total as the Bruins, except they have played less games in each subsequent series. The Bruins have already played in two thrilling game sevens, which will serve as excellent experience against the Canucks. They were pressed by the Tampa Bay Lightning and looked uneven after a dominant second round against the Flyers. They've played as many games as the Canucks, but it feels like they've played 100 more. Luckily, there was a month long break in between the Conference Finals and the Stanley Cup. The Bruins are fully over their collapse last season and look unflappable. After coughing up a 3-2 series lead against the Lightning, they came back and won a nail-bitter in game 7, which was only 1-0 because Dwayne Roloson. The Canucks are solid. After a would-be hiccup against the Blackhawks, the Canucks have improved with every series and are looking like the President’s Trophy winners, rather than a team afraid to lose the big game. The Sedins are firing, Luongo is taking his game to new heights, and Ryan Kesler is hated by everyone he’s played against (the absolute highest compliment you can ever receive as an athlete). Vancouver hasn’t won a Stanley Cup in the history of their franchise, but the Bruins haven’t won one since 1972, so they certainly have some burden as well. The Bruins are the more experienced of the two teams, boasting two Stanley Cup champions (Mark Recchi and Shawn Thornton) to the Canucks’ one (Mikael Samuelsson), but that isn’t saying much. These are two teams that are as far as they’ve ever been. The same nervous energy will pulse through both dressing rooms. Boston is big and their goaltending is outstanding, but their power-play is dormant and the Canucks are just as deep as the Bruins, but the only difference is their top-flight talent is two of the league’s ten best players and one of the best defensive forwards. 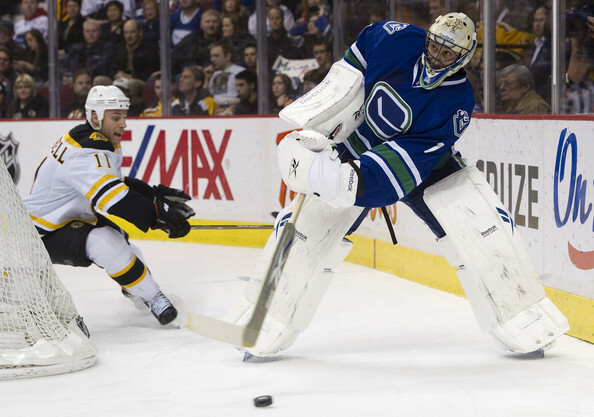 The Canucks take the series unless Tim Thomas steals it (sorry, Dad).